Safety is always a hot topic around the workplace, especially one where the potential for injury is high. The problem with most of these discussions is that they often result in a whole lot of talking and very little action. A common overlooked item that could help solve a lot of safety issues discussed, is safety floor tape. Safety floor tape is one of the most effective visual aids that a workplace can install to keep their employees safe and where they’re supposed to be. When floors are clearly marked, it leaves nothing to the imagination, meaning no one has to ask where they are supposed to be or go. This not only keeps people in safe locations, but also helps increase efficiency. This should be your number one priority when installing safety floor tape. There’s a reason our roads are marked, our freeways have lanes marked in them and our parking lots have clearly marked spots to park (even though that still doesn’t help some). We are used to direction while in motion and the workplace is no different. 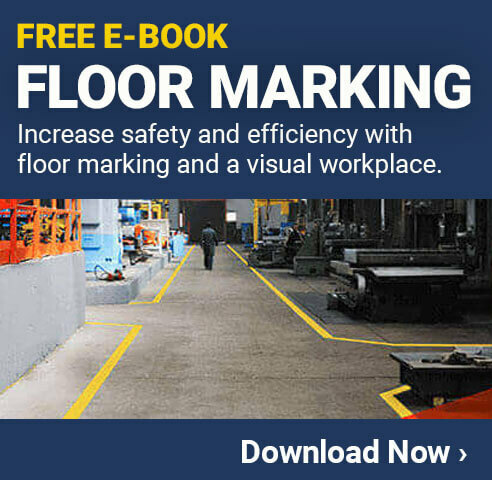 When you mark your floors with safety floor tape, you add familiarity to the workplace. You make the flow of traffic feel natural, leaving little doubt to even the first time visitor, of where to be. Traditionally, most facilities use yellow to mark their pathways. This keeps that familiarity going when connecting the roadways with the pathways at work. Once you have marked your pathways with safety floor tape, you need to implement rules to make sure everyone understands their importance. Much like we have rules to obey on the road, you should have rules in place that address your pathways. If you’re marking off the home of a portable item, the goal is to have a dedicated area that an item can return home to every time. This will help improve productivity, because as long as everyone follows direction, employees will know where to look, when they need an item. This is a popular method used in 5S, which a lot of Lean manufacturing plants use. Marking off items that are non-mobile, such as heavy equipment is still important, even though it may not move. It helps to alert one of the item and make them aware of its presence. For items like this, you can use hazard striped safety floor tape to create more awareness. There are tons of already cut shapes you can buy and it’s made out of the same high quality material as your safety floor tape. These are a great addition to any workplace. The shapes are available in different colors just like your tape and can help in many ways. Whether you’re trying to organize (corners) or trying to lead a customer down a marked pathway (footprints), chances are, there’s a shape out there for you. As humans it is natural to interpret language in different ways. Different words and sayings may mean something completely different to different individuals. However, shapes and symbols provide a universal language that we can all interpret the same way. It’s an easy way for your organization to relay important information where it’s needed most and eliminate any confusion there might of been before. No more waiting- Floor tape takes no time to dry, whereas floor paint may take up to three days to dry before that area is able to be worked in again. This is a serious amount of downtime that will have a major impact on your business. Your safety floor tape is immediately ready for use, once it has been properly applied to the floor. No special equipment to buy- Installing floor paint requires additional equipment that is an additional cost to the paint itself. With floor tape, you don’t have to purchase any special equipment to install it. Durability- This is where the debate ends. Floor paint fades quickly and can be easily worn down by heavy foot and forklift traffic. Safety floor tape on the other hand, has added protection against heavy traffic and will maintain its appearance for years. When it comes to making your workplace safer and more organized, there’s no time to waste. Safety floor tape is inexpensive and about as easy to install, as it gets. The next time you’re in a meeting discussing ways to improve safety in your workplace, take the initiative and show off the benefits of safety floor tape.